Anyone who’s seen Chris Janson perform knows he’s a wild man on stage! Friday night (Sept 28th) was no exception at the Kern County Fair in Bakersfield, CA. He commanded the stage from the moment he stepped onto it as his show felt like a church service and party melded together for one helluva good time! Janson also premiered a brand new rocking autobiographical song after reading a Rolling Stone article that called him “the most open minded redneck on the block.” The title was a bit hard to distinguish but in it he states, “I was raised not to care what people said about me.” In the song, he sings about the article, his family, career and being the “youngest living member to join the Grand Ole Opry” which happened earlier this year. An official Grand Ole Opry mic stand was brought out mid set where he performed a few songs, including “White Trash” and a snippet of “A Country Boy Can Survive.” He mentioned the mic stand was gifted to him by the Opry when he joined it in March of this year. 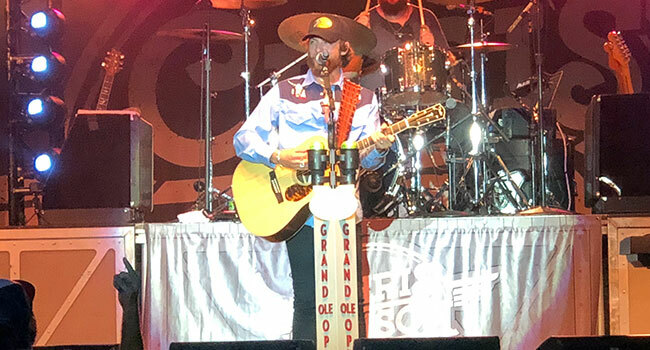 Towards the end of the set, Janson covered a song he co-wrote for Locash, “I Love This Life,” which has been one of the biggest radio hits in the past few years. He also did snippets of Billy Joel’s “Piano Man” and Journey’s “Don’t Stop Believin'” before he went into “Drunk Girl” when the stage lights were cut and the crowd lit up the entire venue with lights on their phones. Janson absolutely loves what he does and is proud of who he is. There wasn’t one time throughout the night where he didn’t smile. He is very grateful for the success he has and shares it proudly with the crowd through his music and the motivational words he brings on stage. If you haven’t seen a Chris Janson concert, you don’t know what you’re missing!